A perfect masking job and paint prep is key to a spotless result. While completing your job on time and with high quality, you are able to stay ahead of your competitors with cost- and time-efficient working. A prerequisite for this is that your masking needs to be spot on. This will prevent any need for a re-do and you can perform at the highest level. This also keeps your costs low, your results excellent and your clients satisfied. Insufficient knowledge of the masking products used > using the wrong products for the situation. Bad application of masking products > due to time pressure or slackness. Incorrect storage of products > use of expired or spoiled products. Increased pressure to reduce costs > choosing lower quality masking products or decreasing the acceptable time to finish a job. A lot of companies save on high-quality masking products or masking in general. However, masking incorrectly will have tremendous effects on your company’s results. If you choose the right products and using them for their advised application you will work more efficiently and with better results. So make sure you use the best car masking tape, degreaser for paint prep and masking paper or adhesive masking foil to get the job done. Invest in high-quality masking products. Choose the correct masking product for your task. Apply your products efficiently but with care. Store your masking products properly. Make sure the surface around your paint job is clean and degreased. This prevents contamination of your paint job and makes sure your masking products will adhere properly to the surface. The Tander Pump Sprayer and Degreasing ClothLink naar productenare excellent tools for this job. Start with the rough work! Apply enough masking foil to stick to the surface. The Tander Transparent Masking Foil Link naar productis available in various sizes so you can always find the right size for your job. 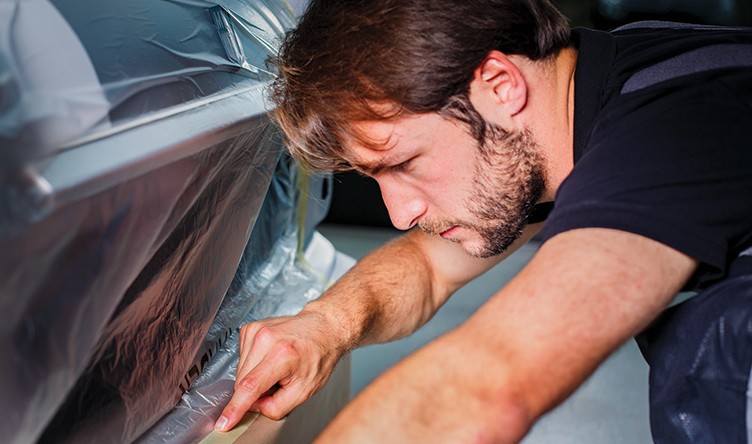 This adhesive masking foil is ideal for the automotive industry. The transparency gives you a good view of the entire surface and the overspray will cling to the foil due to the paint’s adhesive capacities. Cut out the specific spot for your job. You can do this quickly and easy with the Tander Foil Knife; Link naar product a practical tool to cut out contours quickly and easy. If there are any gaps or bonnets, use the Tander Foam Masking Tape to fill these and prevent overspray from accessing these areas. Seal the foil around the spot with a high-quality masking tape. The Tander Masking Tape Link naar product is available in four widths and can withstand infrared drying temperatures up to 130°C for up to 1 hour. The best masking tape for the job, whether you use it as automotive masking tape or for aviation purposes. While applying, make sure you don’t stretch the tape and apply pressure evenly while sticking it on to the surface. This guarantees sharp edges and prevents the paint from running. Any open surfaces can be covered with Tander Masking Paper Link naar product to prevent the paint from bleeding through. To guarantee the best results, remove your masking tape and paper while the surface is still a little wet (or warm while dried in an IR-surrounding). Tander grows from your experience, so we are keen to hear what you have to say! Share your masking jobs, tips and tricks on our online platform or social channels. This helps us improve our products and support you in the best way possible.